Get the Antibacterials Out… Of Your Plastic! Many of us have seen hand soaps and household cleaners that contain antibacterial chemicals like Triclosan. But did you know many plastic food containers do too? All this germ phobia is actually compromising the immune systems of growing children who need to be exposed to a certain amount of germs in order for their bodies to learn how to fight them off. Antibacterials not only kill the germs that make us sick, but also the good bacteria that help to fight off the bad. These additives don’t actually kill all the bacteria. Just the weaker ones. So in this way, we are actually developing strains of superbugs that are increasingly resistant to the chemicals we use to fight them off. Triclosan is actually a suspected hormone-disruptor. Not a great chemical to have in our homes — for our health as well as that of the planet. What about our plastic containers? So many of us are opting for natural cleaners like vinegar and baking soda, but how many of us consider the plastic containers that our natural cleaners are bottled in, much less the plastic containers we might store our food in. Polypropylene (#5 plastic, or PP) has long been considered a “safe” plastic for food-ware. But over a year ago, some researchers in Alberta, Canada discovered quite by accident that their results were being affected by chemicals leaching from the PP test tubes they were using. One of those chemicals was quaternary ammonium biocide — an anti-bacterial agent that manufacturers add to plastics. This finding prompted a study of chemicals that can leach from plastics formerly considered to be inert. In November 7, 2008, the researchers published their study, “Bioactive Contaminants Leach from Disposable Laboratory Plasticware” (PDF), in the journal, Science . Disposable plasticware is used in life science laboratories worldwide. Although labeling of plastics as “sterile” appears to offer researchers some assurance that products are free of bioactive contaminants, the presence of processing additives is unavoidable. Herein, we report identification of two additives leaching from disposable plasticware and demonstrate potent effects on enzyme and receptor proteins. A quick Google search on “antibacterial additives in plastic” found a number of companies marketing these additives for use in plastics. Two of these companies are Life Materials Technologies, Ltd; and the RTP Company, which manufactures several types of antibacterial additives, including Microban, a Triclosan-based product. The market for antimicrobial additives is growing! Helmut Kaiser Consultancy did a whole study of the market for antibacterial additives in plastics and found it increasing steadily. Antimicrobial can be used to control the build up and growth of bacteria in surfaces, such as plactics and other materials. The market for antimicrobial additives has been developing steadily, with the largest market share for the food and beverages industry. Staying safe from germs… naturally. So, what can we do to make sure the products we use are safe? Choose materials such as glass, stainless steel or even wood. Wood is naturally antimicrobial. In a study performed by researches at U.C. Davis, plastic cutting boards were found to hold and breed bacteria much more than wood. The UC Davis researchers note in their report that while other studies have claimed to refute their findings, those studies were performed using only new cutting boards. But in the Davis study, cutting boards with knife cuts (i.e. most cutting boards used regularly) presented the greatest difference between wood and plastic. Apparently, plastic is more likely to breed bacteria than other materials, which is why manufacturers add antimicrobials to it. So, how can you find plastics without these additives? The short answer is that you simply can’t. Manufacturers are not required to disclose the additives in their plastics. We know that chemicals like BPA and phthalates can leach from plastics. What about all the other additives that we don’t know about? Just one more reason to skip plastics altogether. Even the “safe” ones. This post is included in the March 2012 Green Moms Carnival on toxic chemicals hosted at Groovy Green Livin’. The Plastic Sea Monster Joins the Lunchbox Action This Week! This entry was posted in cutlery & containers, Toxicity on March 23, 2010 by Beth Terry. Hi, Mandy. There are all kinds of great plastic-free lunch options! Check out my Plastic-Free Guide (https://myplasticfreelife.com/plasticfreeguide/) and look especially at Item #12 Carry lunches in reusable stainless containers or cloth bags, which had a list of great companies selling plastic-free lunch containers and bags. As a mother of a Kindergartener I am so confused! I want to pack healthy lunches for my daughter, but what the heck do I pack it in? I used to use plastic containers that were “safe” but then worried about the chemicals! 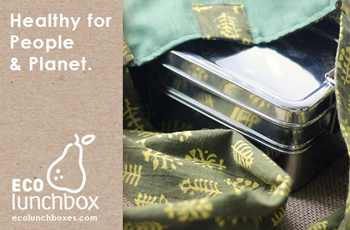 I want to be earth friendly so I don’t like the idea of using baggies…those are plastic too! I want my daughter to get a healthy start, but what can I do? Anyone have safe ways to pack lunches? I have preferred plastic cutting boards for their ability to be thrown in the dishwasher (I don’t like to put anything wooden in there as I think it’s hard on the wood). Looks like I really need to do some re-thinking. Thanks for sharing! I knew that wood had anti-bacterial properties with respect to using it as a cutting board but I had no idea that anti-bacterials might be added to my plastic cutting board AND that cutting board with cuts (clearly mine) would not be cleaned with soap and water. ARGH! I have a couple of glass boards but I have heard they are bad on knives which is why I was still using my plastic cutting board. I guess I had better go out and find a new wood cutting board! Gov. Christine Gregoire signed the No BPA Bill in Washington state, oulaw BPA in baby bottles, sports bottles. Not a complete victory but hell baby steps. Just a quick note to let you know how much I am loving the Soda Stream, Haven’t bought a can or bottle of soda since I got it! Great little machine! Any ideas on the best way to get rid of my scuzzy old plastic cutting board? Are platic cutting boards made from #5 plastic- can I drop it in the Gimme 5 bin at Whole Foods? Great article! All the more reason to switch my left-over and lunch food containers to glass or stainless steel. Wooden cutting boards are great – even better if you can get locally made using wood salvaged from old fruit trees. Our two boards are olive wood. Striving for more whole, raw foods means using a cutting board more often. I highly recommend olive wood because it is durable. Ack! Thanks for sharing this, Beth, I had no idea. I’m trying to avoid new plastic, but I still have some old stuff kicking around. Cool!I always thought wood was better!I’m going to tell my boyfriend this right away :) ! Yet another reason to get rid of that ugly white cutting board. Also, I’d like to thank my mother for not being so crazy about cleaning and germs, and for letting us eat pizza that sat out on the counter all night. I’m sure my immune system is much stronger for it. Jen, is there really any other way to eat leftover pizza? I hate it when someone (not naming names) puts my leftover pizza in the refrigerator and makes the cheese all hard. Room temp and out all night is the best. Aha! I’m glad that my wooden cutting board has proven to be eco friendly! I’ve had so many people tell me that I should switch to plastic- and I hate those plastic cutting boards. Yay! I just watched “Bag It” the 10-minute documentary about plastic grocery bags. The filmmaker posted it to the internet for all to see for free. Very awesome!